Representing Pennsylvania at the Continental Congress. Work: Elected to Provincial Assembly, 1756-1775; Delegate to the Stamp Act Congress, 1765; President of the Provincial Assembly, 1775; Offices in Pennsylvania: Justice of the Peace, High Sheriff, Presiding Judge of the General Court and the Court of Common Pleas, Associate Judge of the Supreme Court of Pennsylvania; Elected to Continental Congress, 1774-77. 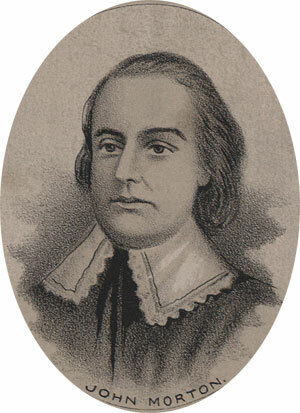 John Morton was born in Ridley, PA in 1724. In his youth he was noted for his quick intelligence and his habit of hard work. His stepfather, a well educated surveyor from England, gave him a sound education in practical matters and in surveying. In 1756 Morton was elected to the Provincial Assembly, and was elected president of the Assembly in 1775. He attended the Stamp Act Congress in 1765. He filled numerous civil offices in Pennsylvania, including Justice of the Peace, High Sheriff, Presiding Judge of the General Court and the Court of Common Pleas. In 1774 he was appointed Associate Judge of the Supreme Court of Pennsylvania. That year he was elected to the Continental Congress where he was a member of several committees and chairman of the committee which reported the Articles of Confederation. He died soon after that report was presented to Congress, at the age of 53.